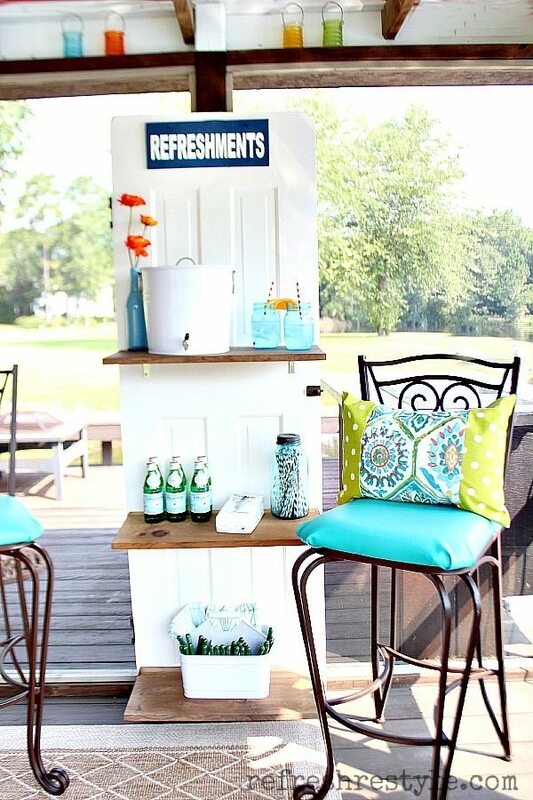 Old doors are great for repurposing! 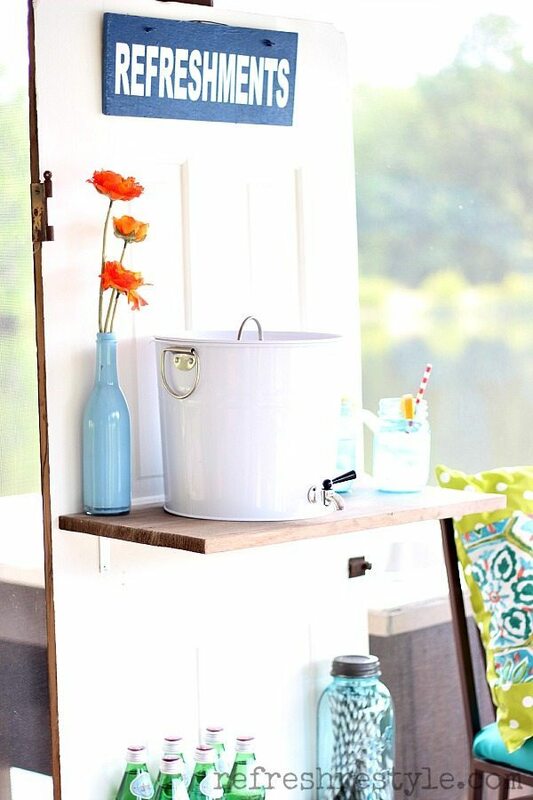 This one was the perfect size to add on the dock to use as a beverage serving station. I used a little paint and a few shelves to bring it back to life. 2. 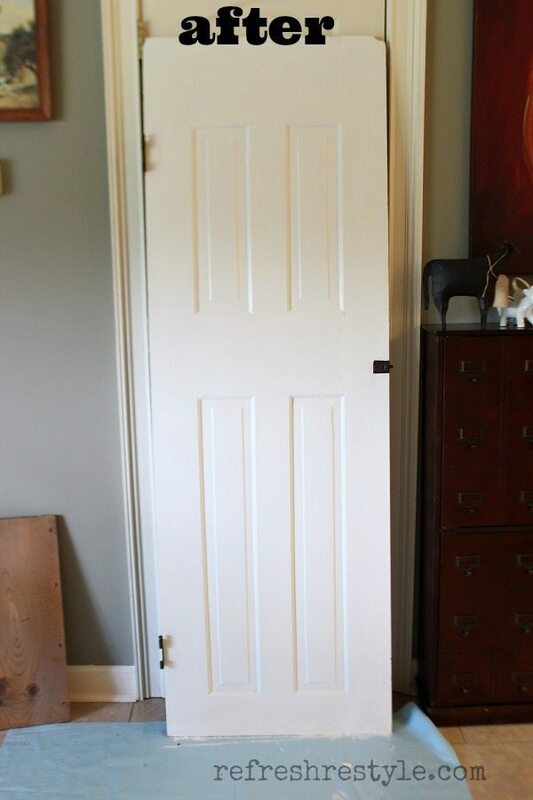 Paint the door, I used two coats of Modern Masters Front Door Paint. It is water based and the coverage was great, it dries fast too, so you can paint your front door and close it the same day! There are 24 beautiful colors to choose from. I included an affiliate link above. 3. I love painting with Purdy brushes, they are hands down the best. The cub handle does not fatigue my had as much as others. 5. Use L-brackets or shelf bracket to attach your shelves. I decided on 3 shelves, you can use as many as you like. I did not paint mine, but you could. Mine were already aged, I’m not sure what they were in a former life. I bought them at a yard sale. 6. I attached my door shelf to an existing 4×4 on the dock. 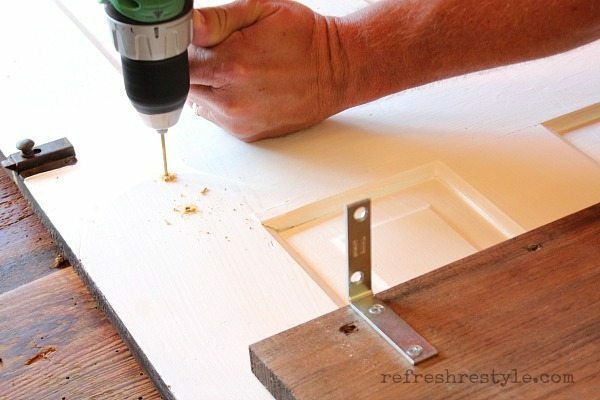 If you’re using yours inside, just locate studs in your wall and attach with screws. 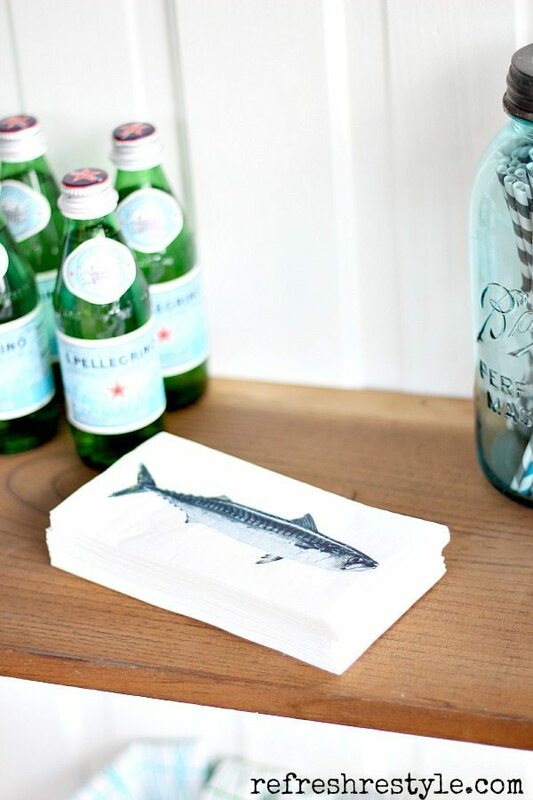 Great for serving food or drinks. 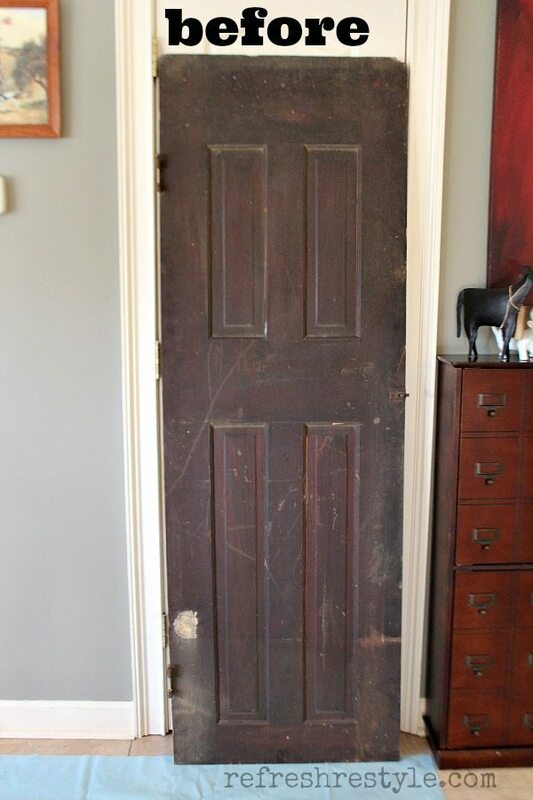 The dark, dirty brown door before. 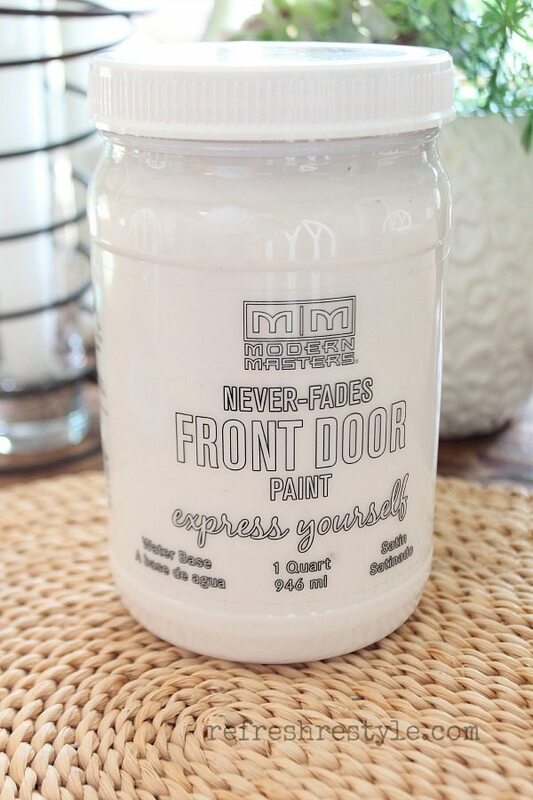 Click here to see: Modern Masters Never Fades Front Door Paint and the color I used is Hopeful. Attaching the shelves. Pre-drill and space your shelves where-ever you like them. I used 3 and left more space at the top but if you were doing a bookcase you could place them all the way up. We ended up using larger brackets than the ones shown. 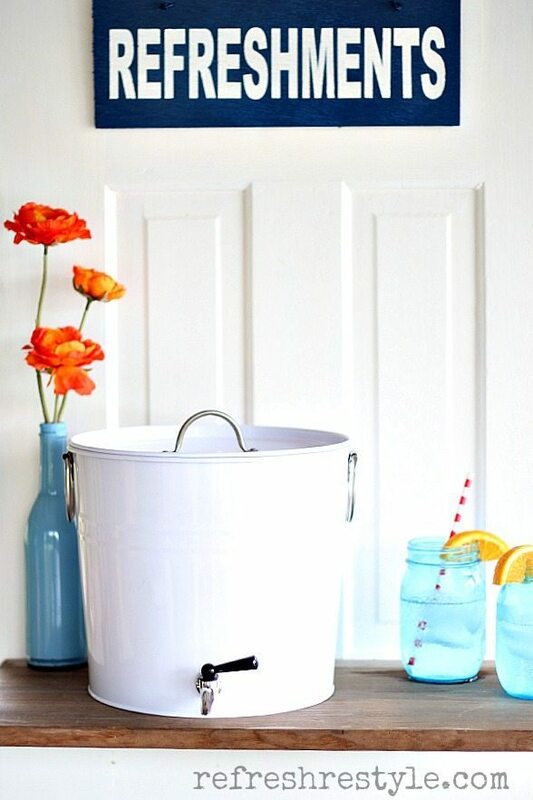 There’s plenty of room for glasses and refreshments. Drink containers or whatever you need. 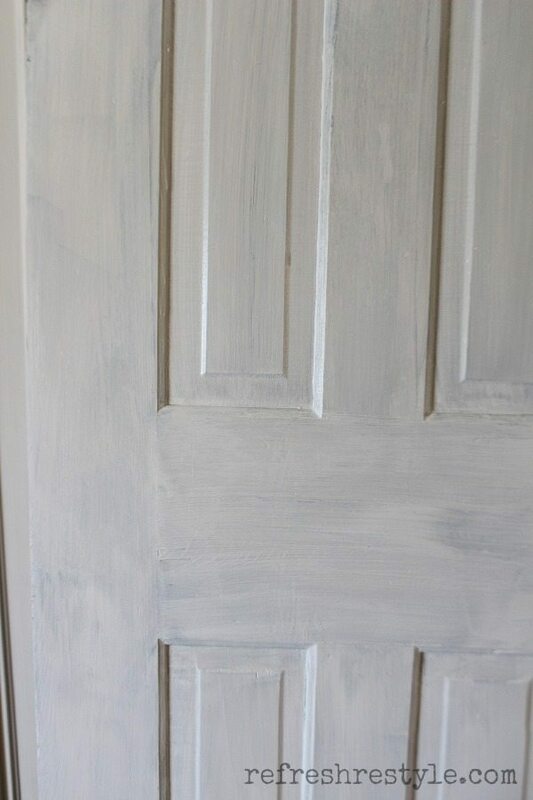 I loved the consistency of the Front Door paint and just want to say thanks to Modern Masters for supplying my paint. 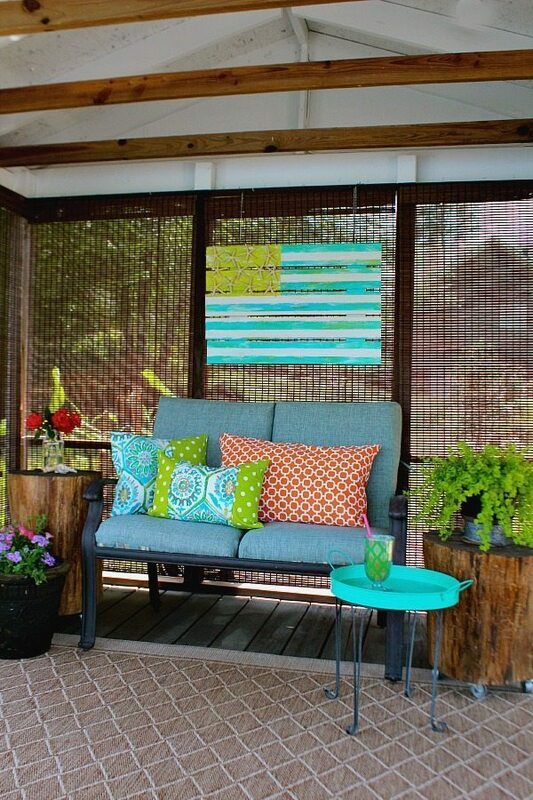 Are you inspired to get outside and repurpose something? 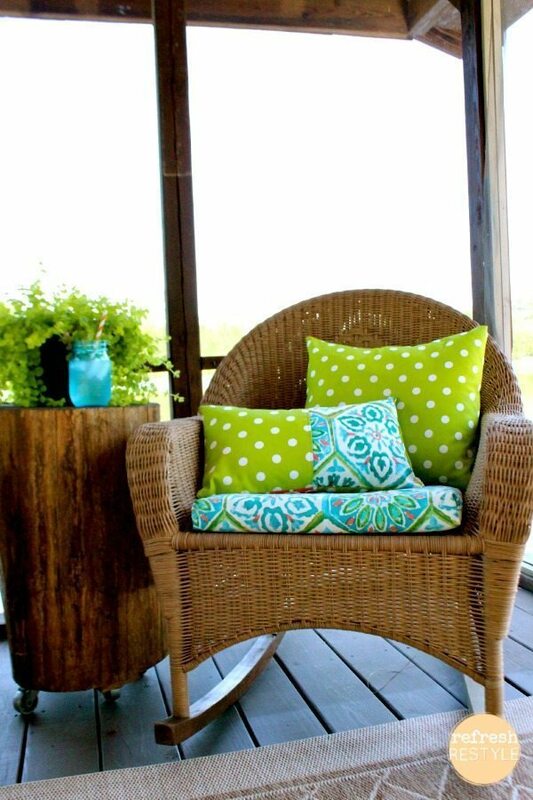 Please please please tell me where you got the chairs! Thank you! Oh yeah, pinned it – it’s awesome! I love, love this Debbie!! 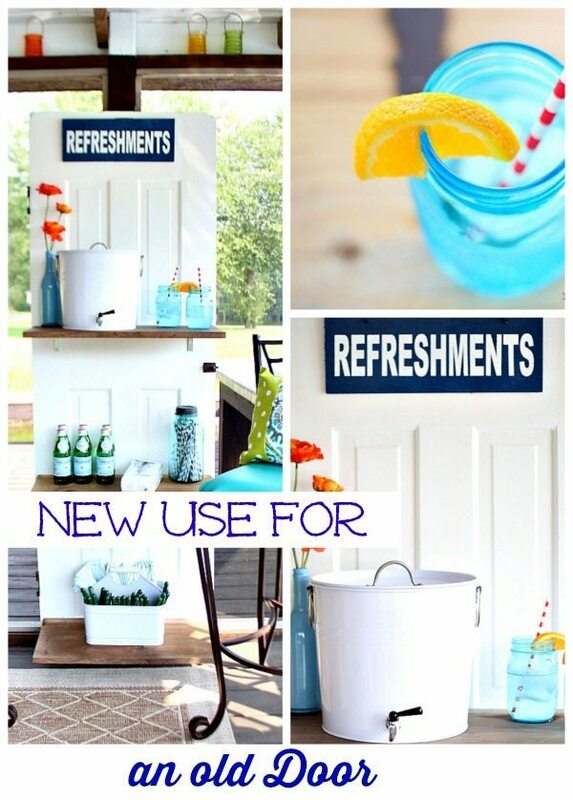 !…such a great way to re-use the door…will have to try that paint soon! I cannot tell you how much I LOVE this! Great job!! Love this!! 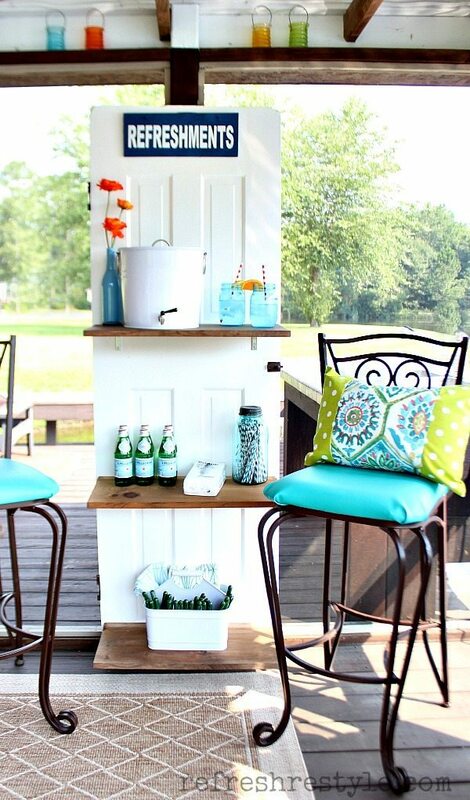 I am such a sucker for old doors and I love seeing new ways to use them. I have a pretty good stash myself. Will definitely be making this one! 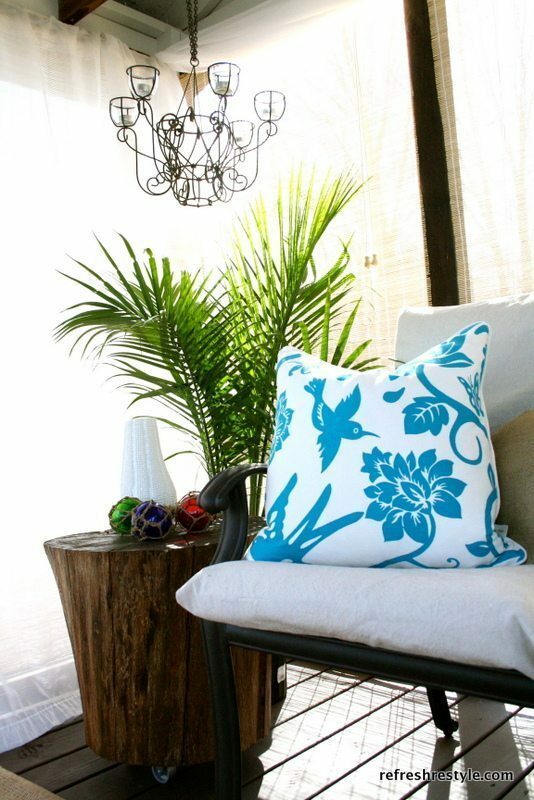 Pinning and sharing, love it! I love this! You make it look so easy, easy enough for me!! Thanks for sharing.